INTRODUCTION: Ameloblastoma is a benign odontogenic neoplasm which is slow growing, locally aggressive, and has a potential for recurrence. Recurrence rates as high as 75% have been reported. If unattended to, it results in large grotesque maxillofacial growths with consequent impairment of function and esthetics. This study aims to report the clinicopathologic and surgical outcome of patients managed on account of ameloblastoma at a Nigerian teaching hospital. MATERIALS AND METHODS: Records of patients histologically diagnosed with ameloblastoma of the jaws between March 2010 and March 2017 at Usmanu Danfodiyo University Teaching Hospital were retrieved. Information on biodata, clinic-pathologic features, treatment modality, mode of reconstruction, postsurgical follow-up period, and recurrence was obtained. RESULTS: A total of 67 patients were included in this study, including 41 (61.2%) males and 26 (38.8%) females; with a mean age (± standard deviation) of 31.43 (±13.65) years. The modal decade of presentation was the third decade of life. Majority of the tumors were right sided 27 (40.3%). Fifty-six (83.6%) of the cases were seen in the mandible, while 11 (16.4%) occurred in the maxilla. Majority of the tumors were multilocular 62 (92.5%). All the unilocular radiolucencies were seen among patients younger than 23 years of age. The most frequently observed histological subtype was the follicular type 26 (38.8%); rare mixed lesions were also seen. Immediate reconstruction was performed in most of the patients. Recurrence was observed in 1 case (1.5%). CONCLUSION: Ameloblastoma remains a prominent health challenge in our climes. Patients often present late resulting in large maxillofacial tumors that are challenging to manage. Ameloblastoma is a benign odontogenic neoplasm of which is slow growing, locally aggressive, and has a potential for recurrence.,,, Recurrence rates as high as 75% have been reported in the literature., It was classified by the World Health Organization as a group of lesions with odontogenic epithelial origin but which lack any recognizable odontogenic ectomesenchyme., Reports of its incidence vary widely and variations based on race, ethnicity, and geographical locations have been stated. It is believed to be of odontogenic origin and credence is lent to this belief by the observation that this tumor typically occurs in the tooth-bearing anatomical regions of the body. Patients generally present with a slow growing, painless tumor which causes buccolingual expansion [Figure 1]a. If unattended to, it may result in large grotesque maxillofacial growths with consequent impairment of function and poor esthetic implications [Figure 1]a. Different modes of treatment have been reported ranging from more conservative techniques such as enucleation to radical surgeries such as tumor resection and reconstruction [Figure 1]b, [Figure 1]c, [Figure 1]d. The aim of this study was to report the clinical, gross surgical pattern, pathologic characteristics, and surgical outcome, following the management of patients with ameloblastoma at a Nigerian teaching hospital. There is a paucity of reports on ameloblastoma from Northwestern Nigeria. Records of patients histologically diagnosed with ameloblastoma of the jaws between March 2010 and March 2017 at the Usmanu Danfodiyo University Teaching Hospital were retrieved. Information on age, gender, clinical features, treatment modality, mode of reconstruction, postsurgical follow-up period, and recurrence were obtained. Tumors were classified based on sites into maxillary or mandibular lesions. The sites involved were further categorized into anterior or posterior mandible/maxilla. Lesions posterior to the canine were classified as posterior lesions, those anterior to the canine were classified as anterior lesions, and lesions which involved the structures anterior and posterior to the canine were tagged combined lesions. The sidedness of the lesions was also recorded as right-sided, left-sided, or bilateral lesions. The radiographic features of the tumors were assessed using plain radiographs, and they were recorded as either multilocular or unilocular radiolucencies. The defects were reconstructed with 2.7-mm titanium reconstruction plates alone, 2.7-mm reconstruction plates and bone grafts, or left without reconstruction. Statistical analysis was done using the IBM SPSS Statistics for Windows, Version 20.0. Armonk, NY: IBM Corp. Chi-square test was used to determine the relationships between categorical variables such as age group and indication for extraction. A total of 67 patients were included in this study. There were 41 (61.2%) males and 26 (38.8%) females, giving a male-to-female ratio of 1.6:1 and a mean age of 31.43 years and standard (SD) of ± 13.65 and range of 11–86 years [Table 1]. The modal decade of presentation was the third decade of life [Table 1]. Late presentation was commonly seen as only 3 (4.5%) of the cases presented within 6 months of the onset of symptoms. 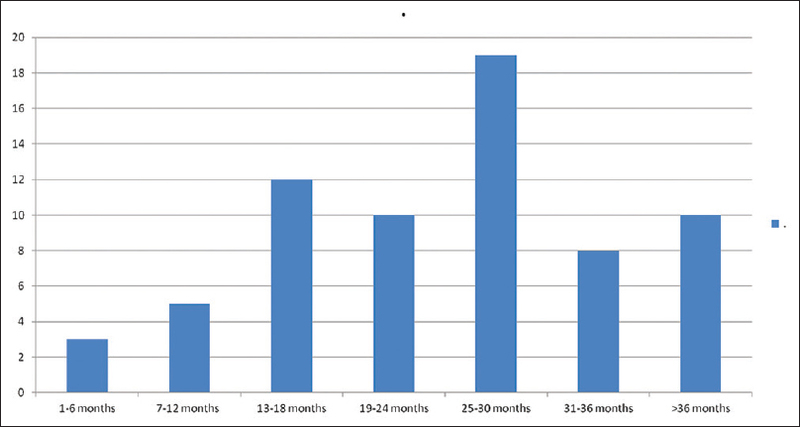 The modal duration of symptoms before presentation was 25–30 months [Figure 2]. Majority of the tumors were right sided 27 (40.3%), 22 (32.8%) were left sided while 18 (26.9%) were bilateral [Figure 3]. Fifty-six (83.6%) of the cases were seen in the mandible, 11 (16.4%) occurred in the maxilla. Only one case of peripheral ameloblastoma was encountered, and it was located on the mandible. All the other cases were intraosseous. The mandibular lesions were observed to be posteriorly located in 23 (41.1%) cases, anteriorly located in 11 (19.6%) cases, and combined in 22 (39.3%) cases. The maxillary lesions were classified as combined in all 11 cases seen. Plane radiographic investigation revealed that the majority of the tumors were multilocular 62 (92.5%) whereas only 5 (7.5%) were unilocular. All the unilocular radiolucencies were seen among patients younger than 23 years of age. This is similar to the reports by More et al., who found unilocular radiolucency among patients <22 years of age. 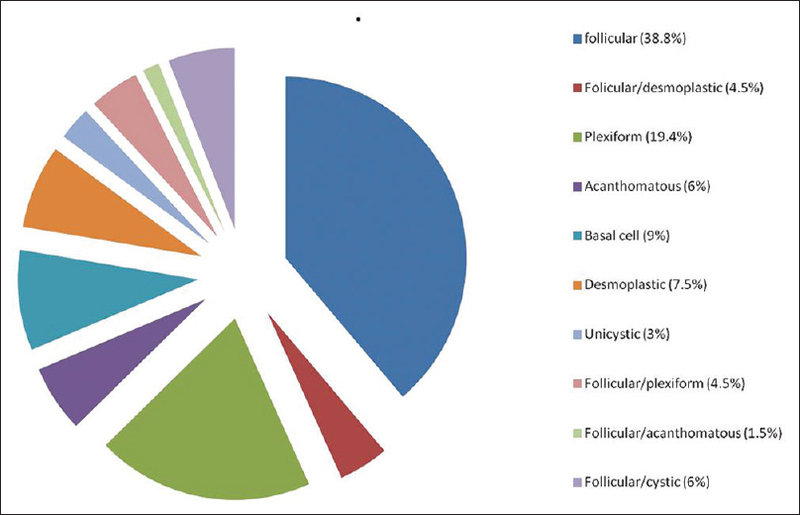 The most frequently observed histological subtype was the follicular type 26 (38.8%) [Figure 4]. 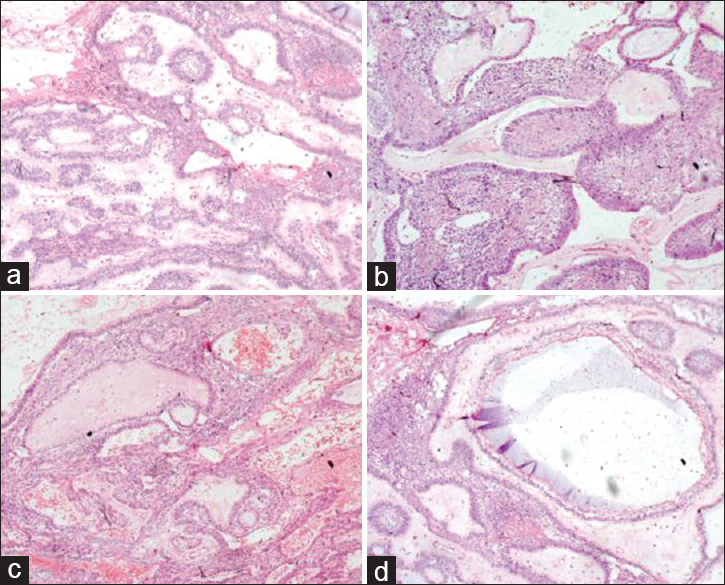 Interestingly, some of the lesions displayed a mix of two histological types [Figure 4] and [Figure 5]. A male preponderance was observed for both the follicular and plexiform histological subtypes. The follicular/desmoplastic, plexiform, desmoplastic, and follicular/cystic subtypes were more commonly seen in males than females. The acanthomatous and the follicular/acanthomatous variants were seen exclusively in males. Surgical resection under general anesthesia was done in all cases. This was because all but two of the cases were solid/multicystic types. The two exceptions were cases of peripheral ameloblastoma which had involved the underlying bone significantly and a case of mural cystic ameloblastoma. In addition, most of the patients presented with massive lesions that exhibited extensive involvement of tissues. Radical resection is the method of choice in these cases. Immediate reconstruction was performed in 55 (82.1%) of the patients, while no reconstruction was done in 12 (17.9%) of the patients. The modes of reconstruction were as follows: reconstruction plates alone 18 (26.9%); a combination of reconstruction plates and rib grafts 35 (52.2%); and a combination of reconstruction plates, rib grafts, and tibial cancellous grafts 2 (3%). The length of the follow-up ranged from 3 months to 72 months. Recurrence was observed in 1 case (1.5%) after 36 months. Subsequently, the patient underwent surgical resection of a recurrent tumor. A male preponderance was noted in this study, which compares favorably with the reports by Tatapudi et al., Selvamani et al., and Oomens and Van der Waal.,, However, a number of other studies show equal gender distribution of the tumor.,,, Few authors have reported a female preponderance. Some authors have attributed this to the predominance of out-of-pocket payment for healthcare in our environment, while others have ascribed it to poor levels of awareness among the populace., Some of the patients in this series patronized unorthodox healers who gave them false hopes of cure, while making financial gains from them. Hence, patients' presentation with grotesque facial swellings was not uncommon in this series. Right-sided tumors were seen more frequently than the left-sided tumors. Few reports on the sidedness of the tumor exist. Li et al. reported a predominance of the tumor on the left accounting for 16 (53.3%) of the cases they reviewed, 11 (36.7%) of the cases presented with right-sided tumors, while 3 (10%) cases were bilateral. In this study, bilateral tumors were relatively commonly encountered, accounting for 18 (26.9%) of the cases. This may be associated with the prevalence of late presentation among the patients, thus allowing for continuous infiltrative growth of the tumor to involve contiguous structures, till it crosses the midline. In this study, the posterior mandibular region was significantly more frequently affected than the anterior aspect. This is in consonance with other reports in the literature., However, it is in dissonance with reports of some researchers who found that the anterior mandible was more commonly affected. The maxillary lesions were exclusively in the canine/premolar region, which is in consonance with reports from the literature. This may also be related to the penchant of the maxillary canine for impaction and its long path of eruption. Combined lesions, which traversed both anterior and posterior structures, were also commonly seen. This may be due to a late presentation by the patients as highlighted in this study, thus allowing the tumor to spread along contiguous structures to involve areas both anterior and posterior to the canine. Only one case of peripheral ameloblastoma was observed in this series, which attests to the rarity of peripheral ameloblastoma. Multilocularity was the predominant radiographic feature in this series. This is comparable to several existing reports in the literature, although it is at variance with the report of Li et al., who reported the unilocular radiolucency as the predominant radiographic pattern in their study. The major radiological appearances that have been described in the literature are the unilocular and multilocular appearances.,,, Variants of the multilocular radiolgraphic appearance that have been described include unicystic, soap bubble, spider web, and honeycomb appearances. Magnetic resonance imaging and computed tomography scan are said to be superior in the delineation and characterization of this lesion. The follicular type of ameloblastoma was the most commonly observed histological type in this study. Similar preponderances were observed by Adebiyi et al., and Ladeinde et al., Nonetheless, it is at variance with the report by Odukoya, who reported the acanthomatous subtype as the principal subtype in a series of 76 cases of ameloblastoma. The second most commonly observed histological type in this series was the plexiform histological type. This contrasts with several reports in the literature.,, The acanthomatous and the follicular/acanthomatous histological variants were encountered among male patients only. This is in congruence with the report of Adebiyi et al. Treatment options include marsupialization, enucleation alone, enucleation and treatment of surrounding bone, and surgical resection., The more conservative techniques, such as enucleation, are advocated in cases of unicystic ameloblastoma (intraluminal type)., Unicystic ameloblastoma is a less aggressive variant of this lesion; hence, it is more amenable to conservative approaches. Marsupialization is often used in young persons in whom the unicystic type of ameloblastoma is diagnosed. However, regular reviews of the patients are needed to ensure success., Radical resection of the tumor is preferred in cases of solid/multicystic ameloblastoma and other variants of the unicystic type apart from the luminal and intraluminal subtypes. Immediate reconstruction was done for most of the patients seen. Immediate reconstruction with 2.7-mm titanium reconstruction plates alone or in combination with bone grafts was favored in most of the cases. Extremes of age, patients' preference, and patients' financial capacity played a huge role in the determination of the reconstruction techniques. Rib grafts were frequently utilized in this series because of its flexibility, resistance to infection, and its length. Tibial cancellous bone graft was used to fill defects between the bone edges in some cases, so as to obtain the maximum interbony contact. Ameloblastoma remains a prominent health challenge in our climes. Patients often present late resulting in large maxillofacial tumors that are challenging to manage. The data presented in this study showed similarities to other studies in the literature, though some differences were identified. The authors would like to acknowledge the management and staff of the Usmanu Danfodiyo University Teaching Hospital, for their support especially in data retrieval for this manuscript. Fomete B, Adebayo ET, Ogbeifun JO. Ameloblastoma: Our clinical experience with 68 cases. J Orofac Sci 2014;6:17. Arotiba GT, Arotiba JT, Taiwo AO. Biologic, anatomic and clinical considerations in the management of the classic intraosseous ameloblastoma of the jaws. Nig Q J Hosp Med 2010;20:55-63. Santos Tde S, Piva MR, Andrade ES, Vajgel A, Vasconcelos RJ, Martins-Filho PR, et al. Ameloblastoma in the Northeast region of Brazil: A review of 112 cases. J Oral Maxillofac Pathol 2014;18:S66-71. Nakamura N, Higuchi Y, Mitsuyasu T, Sandra F, Ohishi M. Comparison of long-term results between different approaches to ameloblastoma. Oral Surg Oral Med Oral Pathol Oral Radiol Endod 2002;93:13-20. Adebiyi KE, Ugboko VI, Omoniyi-Esan GO, Ndukwe KC, Oginni FO. Clinicopathological analysis of histological variants of ameloblastoma in a suburban Nigerian population. Head Face Med 2006;2:42. Kramer IR, Pindborg JJ, Shear M. The World Health Organization histological typing of odontogenic tumours. Introducing the second edition. Eur J Cancer B Oral Oncol 1993;29B: 169-71. Dandriyal R, Gupta A, Pant S, Baweja HH. Surgical management of ameloblastoma: Conservative or radical approach. Natl J Maxillofac Surg 2011;2:22-7. Tatapudi R, Samad SA, Reddy RS, Boddu NK. Prevalence of ameloblastoma: A three-year retrospective study. J Indian Acad Oral Med Radiol 2014;26:145. Selvamani M, Yamunadevi A, Basandi PS, Madhushankari GS. Analysis of prevalence and clinical features of multicystic ameloblastoma and its histological subtypes in South Indian sample population: A retrospective study over 13 years. J Pharm Bioallied Sci 2014;6:S131-4. Oomens MA, van der Waal I. Epidemiology of ameloblastomas of the jaws; a report from the Netherlands. Med Oral Patol Oral Cir Bucal 2014;19:e581-3. Masthan KM, Anitha N, Krupaa J, Manikkam S. Ameloblastoma. J Pharm Bioallied Sci 2015;7:S167-70. Intapa C. Analysis of prevalence and clinical features of ameloblastoma and its histopathological subtypes in Southeast Myanmar and lower Northern Thailand populations: A 13-year retrospective study. J Clin Diagn Res 2017;11:ZC102-6. Ladeinde AL, Ogunlewe MO, Bamgbose BO, Adeyemo WL, Ajayi OF, Arotiba GT, et al. Ameloblastoma: Analysis of 207 cases in a Nigerian teaching hospital. Quintessence Int 2006;37:69-74. Egbor PE, Odai ED. Pattern and prevalence of ameloblastoma in a tertiary hospital – A fifteen years audit. Ann Biomed Sci 2015;14:81-9.
de Moraes FB, Cardoso RM, Rodrigues SV, Dutra MV, Pereira UR, Borges TR, et al. Ameloblastoma: A clinical and therapeutic analysis on six cases. Rev Bras Ortop 2014;49:305-8. More C, Tailor M, Patel HJ, Asrani M, Thakkar K, Adalja C, et al. Radiographic analysis of ameloblastoma: A retrospective study. Indian J Dent Res 2012;23:698. Martins RH, Andrade Sobrinho J, Rapoport A, Rosa MP. Histopathologic features and management of ameloblastoma: Study of 20 cases. Sao Paulo Med J 1999;117:171-4. Gbotolorun OM, Emeka CI, Effiom O, Adewole RA, Ayodele AS. An audit of malignant oro-facial tumors presenting at a tertiary hospital in Lagos. Ann Med Health Sci Res 2016;6:133-6. Adeyemo WL, James O, Ogunlewe MO, Ladeinde AL, Taiwo OA, Olojede AC, et al. Indications for extraction of third molars: A review of 1763 cases. Niger Postgrad Med J 2008;15:42-6. Singh G, Agarwal R, Kumar V, Passi D. Acanthomatous ameloblastoma- a case report. J Int Oral Health 2013;5:54-8. Li W, Liu F, Xu Z, Huang S, Zhu W, Sun C Treatment of ameloblastoma in children and adolescents. J Hard Tissue Biol 2012;21:121-6. Olusanya AA, Adisa AO, Lawal AO, Arotiba JT. 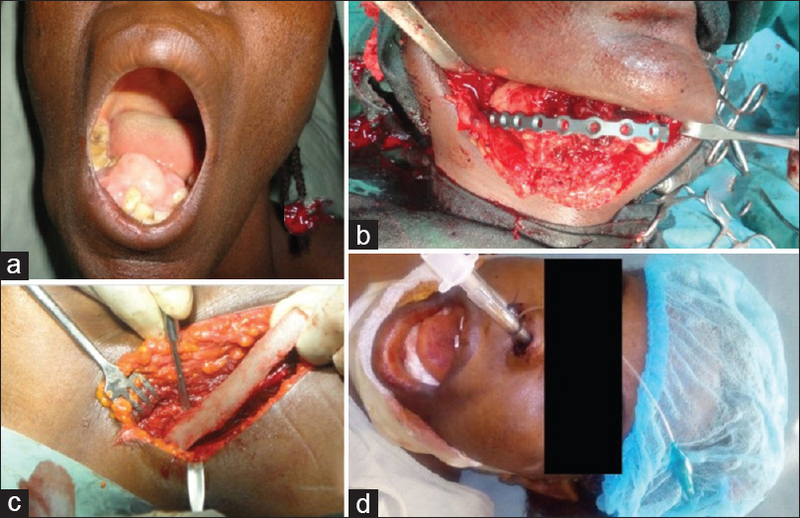 Gross surgical features and treatment outcome of ameloblastoma at a Nigerian tertiary hospital. Afr J Med Med Sci 2013;42:59-64. Dolanmaz D, Etoz OA, Pampu A, Kalayci A, Gunhan O. Marsupialization of unicystic ameloblastoma: A conservative approach for aggressive odontogenic tumors. Indian J Dent Res 2011;22:709-12. Park HS, Song IS, Seo BM, Lee JH, Kim MJ. The effectiveness of decompression for patients with dentigerous cysts, keratocystic odontogenic tumors, and unicystic ameloblastoma. J Korean Assoc Oral Maxillofac Surg 2014;40:260-5. Gold L. Biologic behavior of ameloblastoma. Oral Maxillofac Surg Clin N Am 1991;3:21-71. Eckardt AM, Kokemüller H, Flemming P, Schultze A. Recurrent ameloblastoma following osseous reconstruction – A review of twenty years. J Craniomaxillofac Surg 2009;37:36-41.